Last May, I experienced a “minor” concussion, an injury far too familiar in high school sports. It was quick strike of the metal boom to my head in a high school sailing race, yet it left me with debilitating symptoms for months to come. Immediately after the hit, I said nothing. I kept sailing, pretending as if my unsteadiness was due to mere physical exhaustion. I went on with my entire weekend, lips sealed about the incident. The timing wasn’t right, as it always isn’t, it was just too close to the New England sailing championships. But it wasn’t my first concussion. The previous was a worse hit, also while sailing, yet the events I still cannot recall. As I was told, I was blacked out in the water as my partner shook me back to consciousness. However, there was still one thing better about that hit — I took care of myself then. In the following weeks, I took it easy, set aside time to recover, but that was all in the summer, when I had time. I wasn’t constantly practicing for upcoming championships and cramming in studying for AP tests when I had minutes to spare. This time around, a concussion couldn’t have been more untimely. Despite forgetting nearly everything, there is one moment that I remember perfectly—the following Monday morning. I was in my newspaper class, and in my every effort to keep my eyes glued to the screen, I couldn’t. The light was blazing, torching my eyes, taunting me with an excruciating headache. Upon the request of my teacher, since my stubborn self would never prompt mef to go, I went to the nurse. From the nurse, I was forwarded to my pediatrician. That’s where I got the news that I had already innately known; I had a concussion. I was told that it was most likely minor, that my symptoms would ease in a couple of days, at most a week, as long I said goodbye to the books and set aside technology for awhile. In basic terms, I was told to sit in a dark room, try to sleep, and if I sought out any form of entertainment, to stare at a blank wall. So that’s what I did. Well, in a modified form if I’m being honest. I did sleep, 1- hour durations during the night and punctuated with four or five hour naps during the day. I tried to restrain from any electronic activity and was moderately successful. Despite the doctor’s orders to relax, the thought of missed school work accumulating made me return to school before I should have. So I went to school, but only lasted an hour. The lights were too bright, the students too loud, and readings too long for me stay for any longer. I wanted to return to school, to routine, but my body wasn’t accepting it. In the weeks previous to my concussion, my team and I qualified for the New England’s women’s championship. I sailed in the qualifier, qualified as the A team boat and now couldn’t compete in the championship if I didn’t attend school. I deliberated with myself, tried to balance the importance of my health versus the importance of sailing. 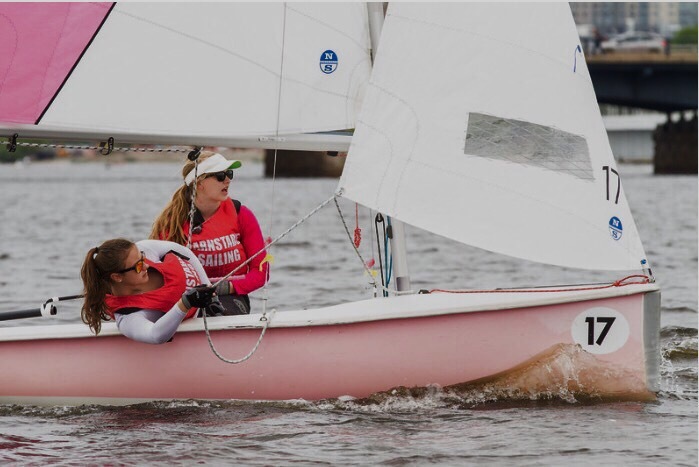 I came to the final decision to not sail that weekend, in the face of the need to recover, and in the mindset that I’d have to be ready to sail in the co-ed championships the following weekend, which turns out, I couldn’t sail either. I tried to force myself back into routine. The school did not permit me to return to high school sailing, but I returned to sailing with a club team. I was training on the weekends, and allowed myself to jump back into the deep-end before my brain was ready to swim. I spent the summer sailing, long practice hours, traveling across country with barely a second to catch my breath. Once I fully returned to school in September for my senior year, I was not the same. I’m not saying that I’m drastically different, but was harder for me to attain the same grades as I did before, to focus in class, to be the same student. I didn’t recognize that a concussion could have long-term cognitive effects. I thought that was just for football players who hit their heads so many times that they couldn’t count their concussions on both hands. I didn’t think I would be a story of a harmful concussion, one of those stories that your doctor tells you to scare you. But I was. I had to realize the damage I did to my brain, I had to realize the reality of my concussion — it was serious.